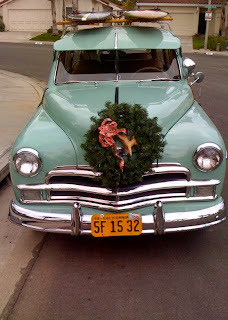 The last time I was able to snap a shot of my neighbor's sweet 1950 Plymouth Woodie, he was departing in it for last year's annual Encinitas Christmas Parade. 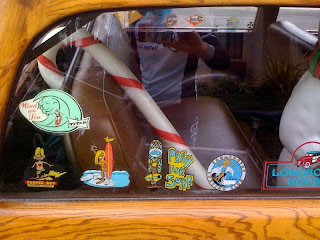 Well, flash forward 364 days and I came across the car in the street, idling and ready to go. 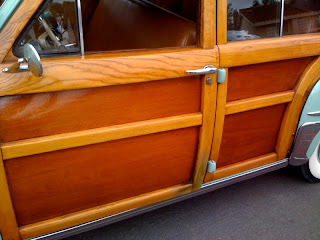 The combo of the mint green and two shades of heavily varnished wood works so well on this car. 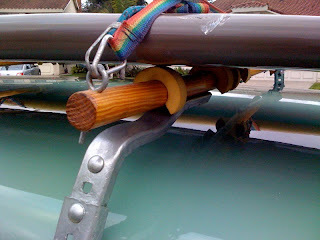 Incidentally, peeling back layers of paint shows that our old wooden runabout (boat) was originally mint green. How cool would this Plymouth look towing the Dragonfly (aka "Aqua Fury")? 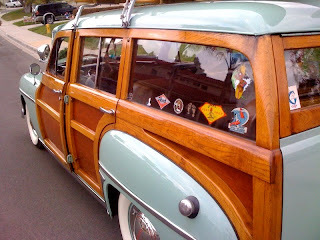 I love the broom handle-style wooden roof racks that are used to carry his vintage surfboards. Nice stamped-steel "towers" too. 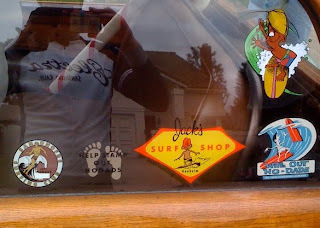 Neighbor also has an appropriate collection of vintage surf decals to complete the look. He told me that he bought the car as a basket case years ago and restored it. However, I don't know if he restored it or if he just whipped out his checkbook.